Just a little over a month ago audiences got there first look at Wonder Woman in Batman V. Superman: Dawn of Justice. Even though the reviews on the film were less than stellar, one thing is for sure, audiences and critics alike, really enjoyed Gal Gadot's Wonder Woman. 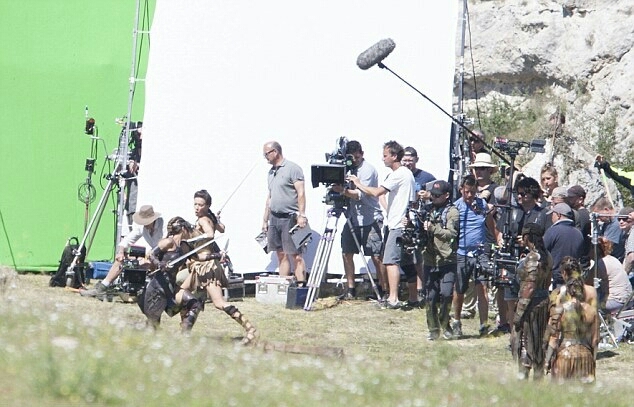 Now just to wet everyone's appetites a little bit, we have discovered some cool new on set photos of what looks to be a pretty cool sword battle being filmed for next year's Wonder Woman film. Although Gal Gadot is not in the images, her stunt double is there filming a scene in her place. Check out all the cool images we scooped up earlier below and enjoy. Let us know what you think, sound off in the comments below. Wonder Woman is set to hit theaters on June 2nd.